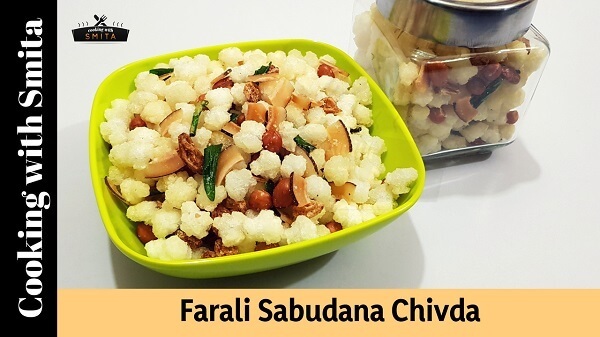 Farali Sabudana Chivda – a tasty & crispy Namkeen/snack made from Nylon Sabudana (Tapioca Pearls). This Nylon Sabudana is easily available in local grocery stores. I’ve added Peanuts, Raisins and Dry Coconut to make this Chivda for Fasting Days. You can also season with Red Chilli Powder or other spices which you eat during Fasting Days. But, I’ve used Powder Sugar and Rock Salt only for seasoning. You can eat this Upvas Chivda during Vrat/Upvas/fasting days like Shravan, Navratri, Ekadashi etc. Heat oil in a Kadai/wok over medium to high flame. Using metal frying strainer, deep fry Nylon Sabudana Pearls until they puff up. Keep turning them around using a spoon to fry evenly. Remove from oil and drain on a paper napkin to remove excess oil. Lower the gas flame and fry peanuts for 2 minutes, until they become crispy and change colour. Deep fry Raisins until they puff up and turn golden brown. Similarly, fry Coconut until they turn golden brown. As soon as all the ingredients are fried, drain them on a paper napkin. Finally, fry Green Chillies and Curry leave together. Place all the fried ingredients in a large bowl and let them cool down to room temperature. After cooling them, sprinkle Powder Sugar and Rock Salt using a strainer and mix well. Farali Sabudana Chivda is ready to eat. This Upvas Chivda can be stored in airtight container for up to 15 days.